The Glow Blogs Reader is designed to help with that. We strongly advise teachers follow their pupil blogs. 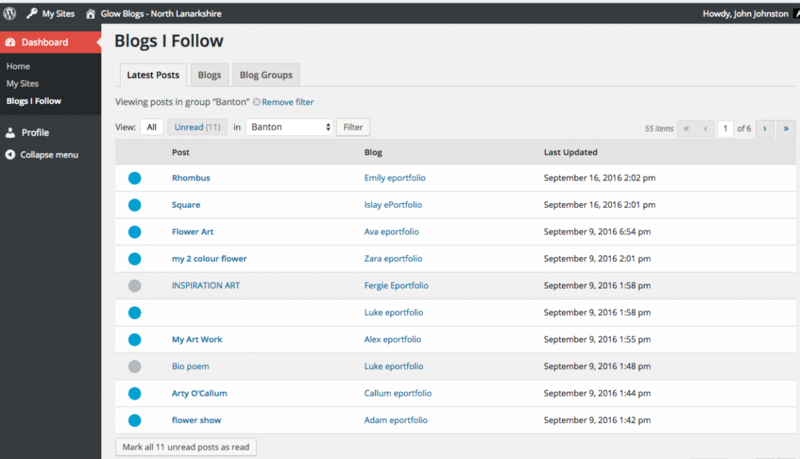 This means they can see all the new posts form all of the blogs they follow on one page on their Dashboard. If a pupil’s e-Portfolio is private the pupil needs to add any teacher (and fellow pupils) to the users list in their blog. Often they will want to add at lease one teacher as an admin. If a pupil’s e-Portfolio is made Glow Only, any Glow user will be able to access their blog, if they know the URL. In both cases the urls will need to be shared with the teachers and pupils who need to access them. These methods can be used to initially gather links to the blogs. Once a teacher has all of their pupils blogs they can use the Glow Blogs Reader to follow all the ePortfolios and get notified of new posts from them all on one page on their Dashboard.